Successfully Added Universal Portable Battery Charger- 13200mAh, iPad, iPhone, Laptops, Tablets, Smartphones to your Shopping Cart. Keep your devices charged and ready to go with this portable battery charger. The whopping 13200mAh is enough for many more hours of usage or as an emergency power supply for virtually all of your portable electronic devices and gadgets, including the iPad, iPhone, Android smartphones, and much more! 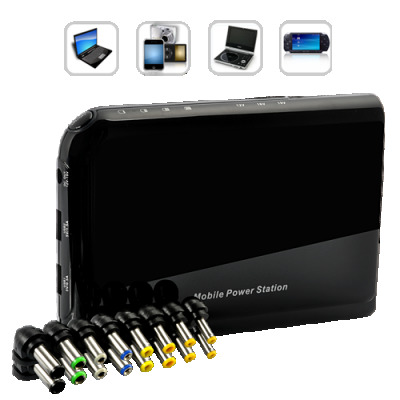 This Universal Portable Battery Charger comes with an amazing 13200mAh of power along with interchangeable adapter tips for use with most laptop brands and models (IBM, Acer, Lenovo, Asus, HP, DELL, Fujutsu, NEC, SONY). Even better, the USB port also provides an easy and instant backup power source for your iPod, iPad, iPhone, SAMSUNG Galaxy Tab, virually any smartphone, and many other electronic devices. When the battery charger is out of juice, just recharge it back up with the provided power adapter - it's that easy! This 13200mAh Universal Portable Battery Charger is also slim, compact, and relatively light so it will fit perfectly in your briefcase or backpack. You can also keep one in your car to provide juice to all your electronic devices on those long road trips. The benefit to you - getting many extra hours of mobile phone talking, MP3 listening, video watching, game playing excitement with this universal portable battery charger! This universal portable battery charger is rugged built to be reliable for many, many years to come. It's designed with important safety features such as overload and short circuit protection to protect your valuable electronics. Brought to you by the leader in direct from China wholesale electronics - Chinavasion!